Dog's Dinner with Lamb, Sweet Potato and Mint is a delicious recipe that your dog is sure to love. 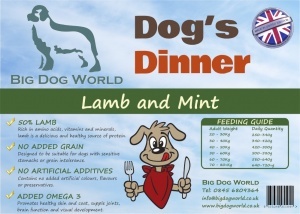 With 50% Lamb and added Omega-3 for healthy coat and joints. My dog loves the Dogs Dinner food and it is always delivered promptly and efficiently.